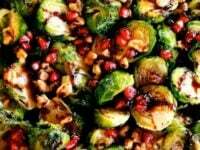 In this recipe for Roasted Brussels Sprouts with Pomegranate Molasses, tender roasted sprouts are topped with sweet, rich homemade pomegranate molasses, toasted walnuts and fresh pomegranate arils. This beautiful dish is filled with texture and flavor, a delightful side for a holiday gathering. There may be no vegetable that is as polarizing as Brussels sprouts. Those who like them love them, while those who don’t seem to loathe the very thought of them. I never really understood the aversion to Brussels sprouts. I often wonder if the loathing stems from never having them well cooked. Steamed and boiled Brussels sprouts are pretty boring, I’ll give you that. Roasting, however, brings out a magical flavor from these little veggie treasures. Roast them with olive oil, salt and pepper, then drizzle them with a scrumptious sauce. Like magic, Brussels sprouts go from boring veggie to crave-worthy side dish. Brussels sprouts are actually a variety of the common cabbage, with several miniature cabbage-like heads growing around a stem. They are known by a variety of names, including “nobby greens,” “bonsai cabbages,” or simply “sprouts.” Though an early ancestor of Brussels sprouts may have been culivated in ancient Rome (there is some debate on this), Brussels sprouts as we know them today first gained popularity in Belgium and are named for– you guessed it– the city of Brussels! They were grown in English and French gardens at the end of the 18th century, and we can credit American Founding Father Thomas Jefferson with planting them in his Monticello garden in 1812. Over time, their popularity spread throughout the United States. Here I’ve roasted a batch of Brussels sprouts, then drizzled them with my homemade pomegranate molasses. I highly recommend using my molasses recipe, as it is sweeter and richer than the average bottled pomegranate molasses. It’s super easy to make, and can be made a few days ahead to save on time. Scatter these Brussels sprouts artfully on a platter and serve them at your next soiree. I ate a full plateful of them a few nights ago, just after I snapped these pics (which might explain why I didn’t take the time to properly light them… I was hungry!). It was both my lunch and dinner, and I was a happy camper. 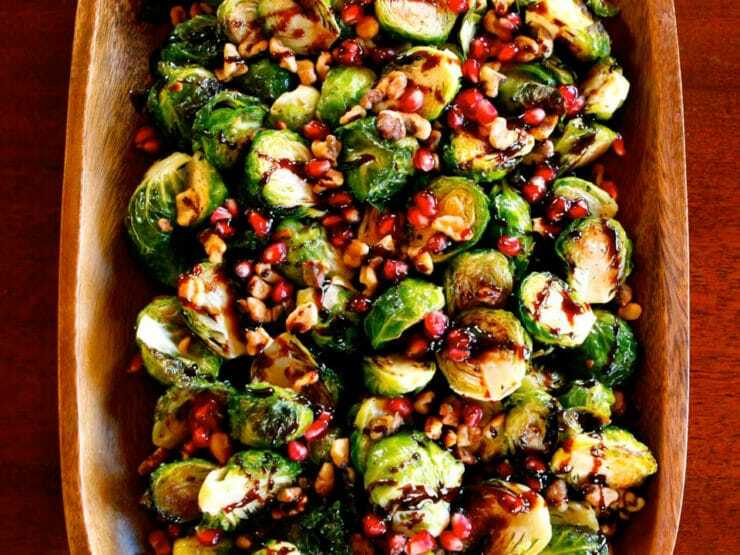 The crispy yet tender roasted Brussels sprouts were perfectly dressed by the sweet tartness of pomegranate molasses. I especially loved the crunchy toasted walnuts and those little bursts of sweetness from the pomegranate seeds. I can’t imagine a more easy or elegant side dish for your holiday table. So what about you? What do you think of Brussels sprouts… love ’em or hate ’em? 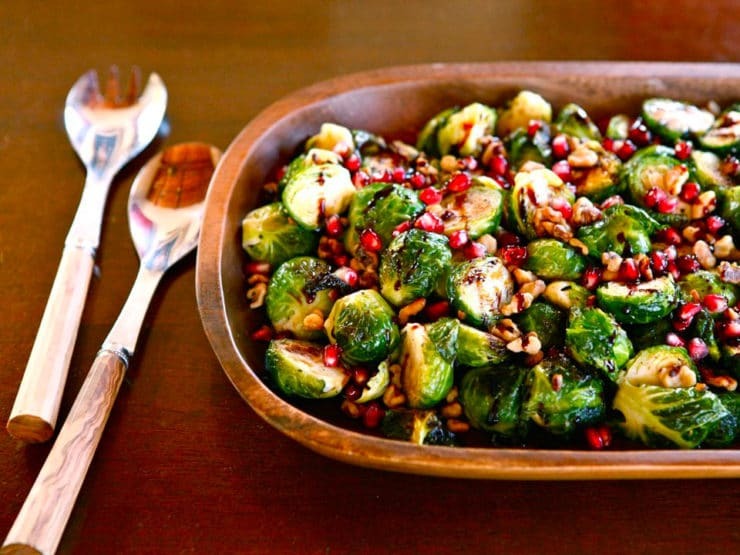 Simple and delicious side dish with roasted Brussels sprouts, toasted walnuts, pomegranate molasses & seeds. Recipe for pomegranate molasses. 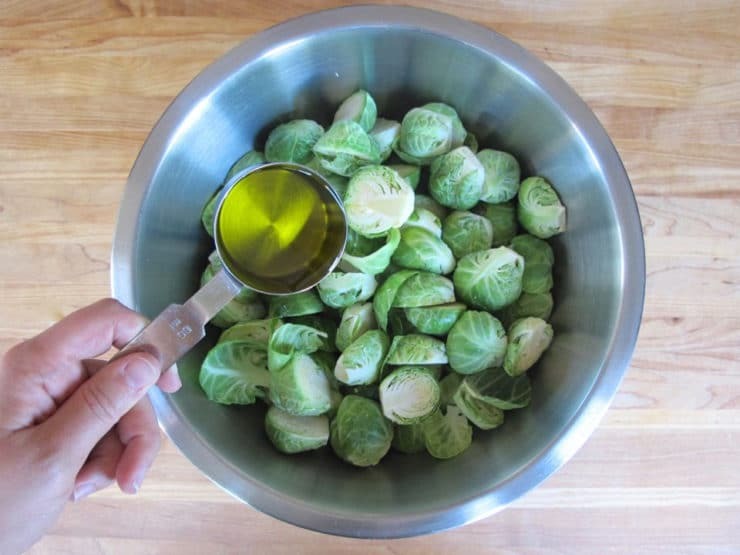 Preheat oven to 450 degrees F. In a large mixing bowl, toss the Brussels sprouts with the 1/4 cup of olive oil. Spread evenly a sheet tray covered with aluminum foil. Sprinkle with salt and pepper to taste. Roast for 15 minutes, until some of the outer leaves start to blacken around the edges. Bite through one to test for tenderness and doneness. I like them quite tender. 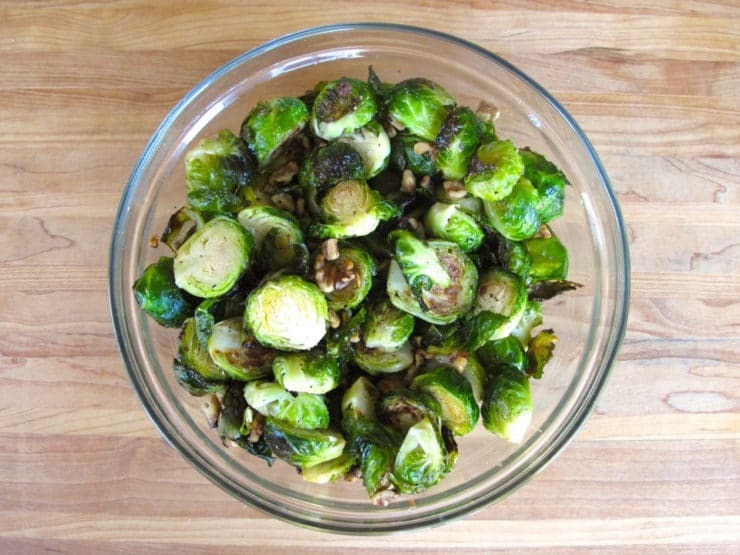 In a large mixing bowl, toss the roasted Brussels sprouts with the toasted walnuts. Place on a serving dish and drizzle with the pomegranate molasses, then sprinkle with pomegranate seeds. Serve. Love this recipe and all you do! Could I make this the night before and re heat it next day? Hi Shira! 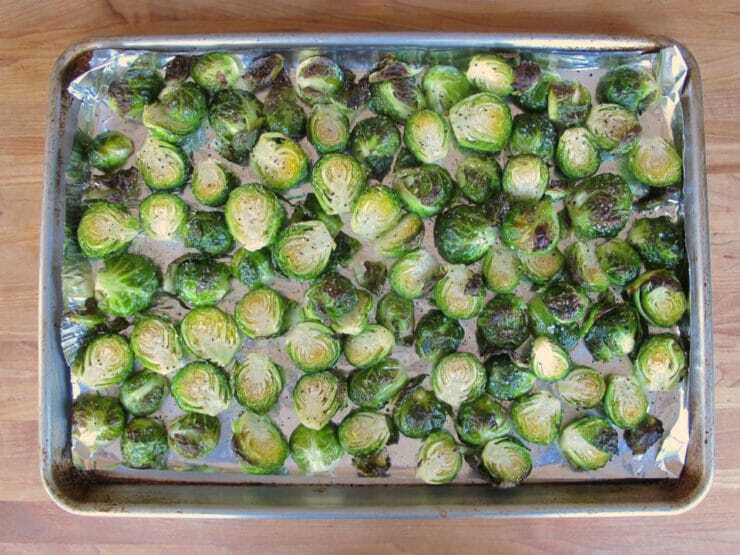 Feel free to roast the brussels ahead, they reheat nicely. The pomegranate molasses can be made ahead too, and the toasted walnuts. I would wait until just before serving to reheat and combine all ingredients. Enjoy! HI Tori, I can’t wait to make these tomorrow night for Rosh Hashanah. Can I prepare earlier in the day and reheat before serving? Thank you. Hi Beth! No problem, roasted vegetable dishes like this tend to reheat very nicely. Be sure to add the molasses and pomegranate seeds after reheating, not before. Enjoy! My son has a nut allergy, would pine nuts work with the pomegranate? Hi Scott, Tori’s assistant Ashley here. I think pine nuts would make a nice substitute in this recipe. Isn’t this a Bobby Flay recipe? Bobby Flay may have something similar. Google and you’ll see lots of versions of this dish. This recipe was a HUGE hit at Thanksgiving. My daughter and I had fun making the pomegranate syrup (which we will use on pancakes tomorrow!) and the blend of the crunchy pomegranate seeds with the crispy brussels sprouts was perfect. Was hoping to have leftovers… nope! Just saying… making these for a Christmas Eve dinner tomorrow night. Love the pomegranate syrup and I’m munching on the seeds right now. Will keep making this recipe!!! 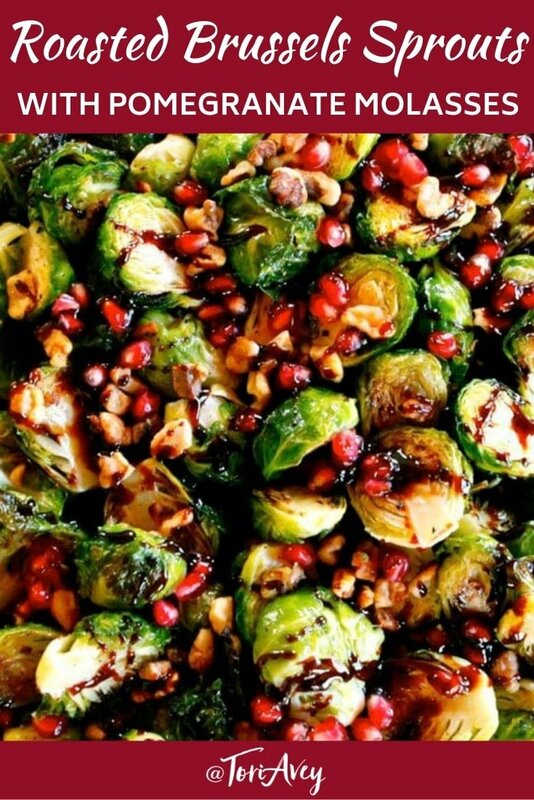 We served the brussel sprouts and pomegranate syrup this year for Passover and they were definitely a hit! Thank you for another great recipe to add some variety! Great Kaelee! Thank you for writing. I made these for a get-together over the holidays. Delicious! I added red wine vinegar to the pom molasses and reduced it to a languid slurry before adding to the roasted sprouts. I could eat this every day! The Brussels sprouts adverse out there will be converted (to Brussels Sproutism?) by this revipe. This was really too sweet. I was not a fan of the overwhelming sweetness. I’m sorry to hear that Andrea. You can certainly cut down on the pomegranate molasses and seeds, or eliminate them altogether, if you prefer a more savory dish– they roast up great with just olive oil, salt and pepper. I’m looking at this for Thanksgiving. Do you think it could be made ahead and heated up? The prep can all be done ahead (making pom molasses, roasting walnuts, etc.) 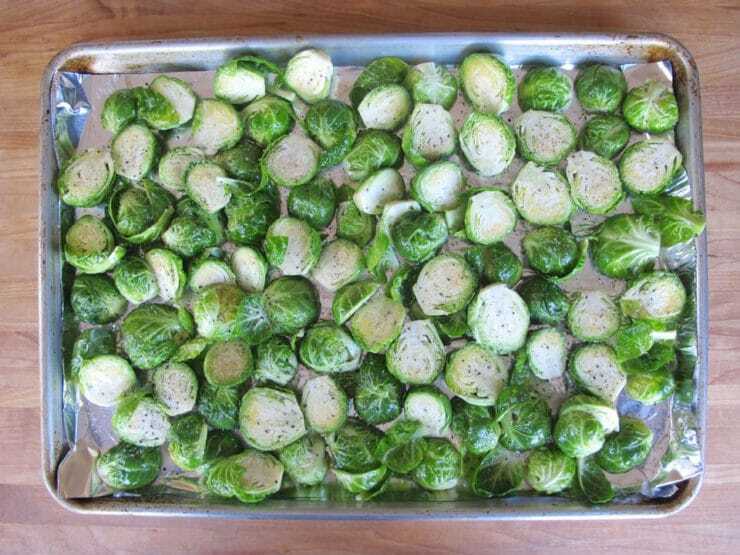 but I recommend roasting the Brussels sprouts as close to serving time as possible for the freshest taste. Hey Tori these look delish! Is there a seed substitute instead of walnut? My niece is allergic. What about roasted pumpkin seeds? Pumpkin seeds would be great Kendall, also toasted sunflower seeds would be nice. I haved loved them for years but only because of one secret I found. Buy medium to large ones and peal away leaves until the dark green is gone (almost white) aand then cook them. The strong, bitter flavor is from the heavy dose of dark green, probably Chlorophyll in the outer leaves. Love them – roasted! This recipe looks yum! I made your pomegranate molasses a couple of years ago; I’d seen you demo at Zabar’s in NYC and you used it on brisket. I used it on a turkey breast (hubby & some others don’t eat red meat) and it was delicious. So cool that you made it out to the Zabar’s demo Amy! You will love this recipe, it’s another great way to use the pom molasses. Enjoy! Another variation: I do mine with rings of leeks on top. I bake them until the leeks are brown and crunchy, and the bottoms and outside of the sprouts are brown and crunchy too (lay 1/2 sprouts flat side down and careful they don’t burn). Some sliced mushrooms between the sprouts on the bottom and the leeks on top are great too! This year my marker selling them $2.50 a lb! Buying 2lbs freeze a pound! Yum their delish in homemade veggie only soup cut them in half! Oh I love them! roasted golden brown , I whip olive oil evoo and fresh lemon juice dash balsamic vinegar and make a cold salad w them yum! Nice!!! I’m going to have to give this a try. Very festive looking too! Most kashrus agencies advise not to eat whole brussel sprouts as there is no way to check for insects properly without destroying the vegetable. Hi Moshe, if you prefer you can slice them in half prior to roasting, which may make them easier to clean. Love them roasted with red onion and drizzle balsamic vinegar in then. DELISH!